If you read this blog, you know I've recently become addicted to The Wire. Many years ago, I had a similar addiction to the show Oz, and currently I'm a keen follower of the show Lost. The Wire, Oz and Lost have one other thing in common. That's the man you know, even if you don't know his name. I'm talking about Lance Reddick. I first saw Lance Reddick on television as Detective Johnny Basil, an undercover narcotics officer working under the false identity of Desmond Mobay and trying to bust the drug trade in Oz. I used to do a pretty good imitation of Mobay. I then saw Reddick in Lost as Matthew Abaddon, a man who works for Widmore by "helping people get to where they're supposed to be". It was nice to see him again. Then, I started watching season one of The Wire. 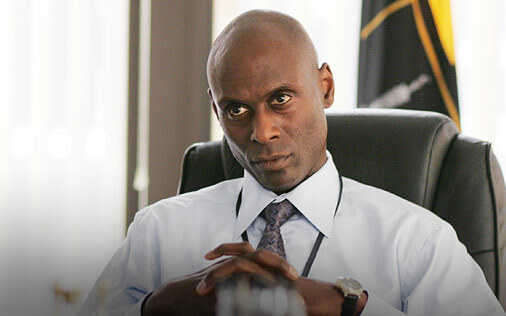 Reddick has a juicy role in this HBO drama, playing Cedric Daniels, commander of the Barksdale Detail in the first season. Reddick is great. I hear he now has a prominent role in Fringe. With his track record, I'll bet Fringe is a winner. The Wire has a lot of OZ people. Bodie, Carver, Daniels. All of them with pretty good roles. I always found the character of Kenny "Bricks" Wrangler on OZ pretty funny and then I got to see him as Bodie on The Wire. Oh and now Stringer Bell (Idris Elba) will be on The Office tonight. Yay!!! Sweet, that's one of the few shows I actually watch. It was funny seeing Stringer Bell and Michael work together.